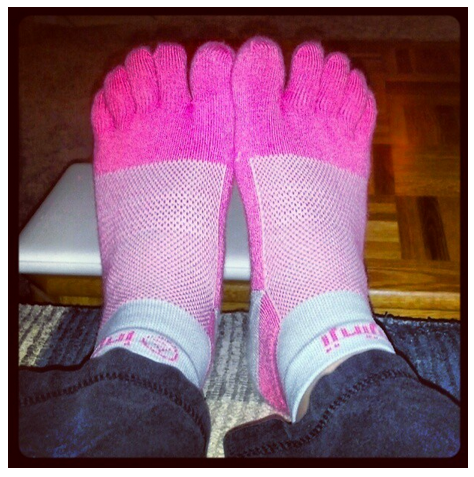 Mindy's fitness Journey: Wiggle your toes! Injinji toe socks fun!!! Hey there! I just had to get a blog up about a cool thing happening today!!! Head on over to Injinji's website and blog!!! For the website click HERE and the blog click HERE! Injinji is poised to raise the standards and status of athletics’ unsung hero - SOCKS. With this toe-tally awesome video below, boasting Injinji’s weird and wonderful 5-toe sleeve design, you get a taste of what you can expect from the company as they not only bring Performance 2.0 to shelves, but launch an entirely new website set to go live Today!!! We will be having a giveaway soon! Keep your eyes peeled! INJINJI® Any Shoe Video from Injinji on Vimeo. I still have mixed feelings. One run mine are great, the next not so much. I guess I should try them more. I love mine too. They stopped my blisters on long runs.